I'm visiting a friend who lives on the north coast of New South Wales. From tomorrow we'll spend three days at the Byron Bay Writers Festival, which seems to have become one of my yearly pilgrimages. But today we travelled to Murwillumbah to visit the Tweed Regional Gallery which, earlier this year, installed a replica of the studio of renowned Australian artist, Margaret Olley. 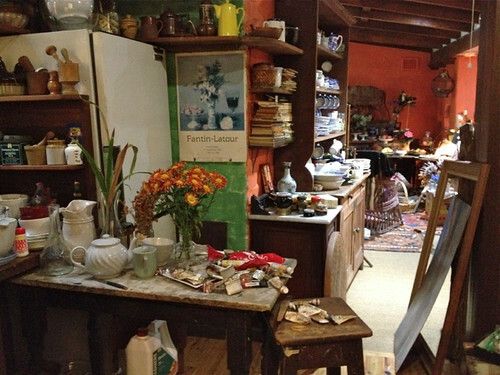 Australian painter Margaret Olley's life has been well-documented - she and her studio home have been photographed, painted, and filmed. There are biographies and beautiful catalogues of her many exhibitions. She was a gregarious host and attended many public events and, as she became wealthy, was a generous benefactor to the NSW Art Gallery, as well as a number of regional galleries (including the Tweed Regional Gallery). It seems very appropriate that as her life was so public, so the workspaces of her home and studio are now on public display. The recreations are lovely. There's such vibrant colour, so many wonderful shapes, and such appealing vignettes in the midst of clutter. 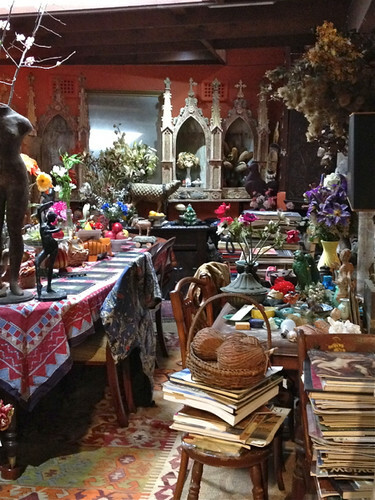 I wonder why we find artists' studios so appealing? I imagine one reason is that it gives us an insight into the process of an artists' work: not just the end product, but the way the work grows and is constructed. Olley's studio, like that of Giorgio Morandi I saw years ago in Italy, is particularly interesting because it contains many of the objects - the jugs and bowls and fabrics and rugs - that occur and recur in her still lifes and domestic interiors. The Tweed Regional Gallery goes from strength to strength. Among other works it currently has an exhibition of works on paper by prominent Australian artists that I found very engaging. 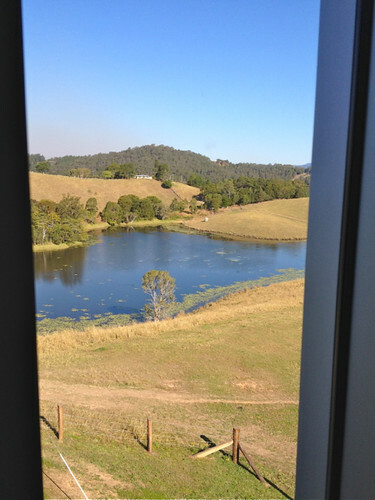 And there's always the landscape, attention-arresting as you approach the Gallery and see the river and paddocks with mountains to the west, but just as wonderful when glimpsed through the narrow windows that punctuate the gallery's walls. 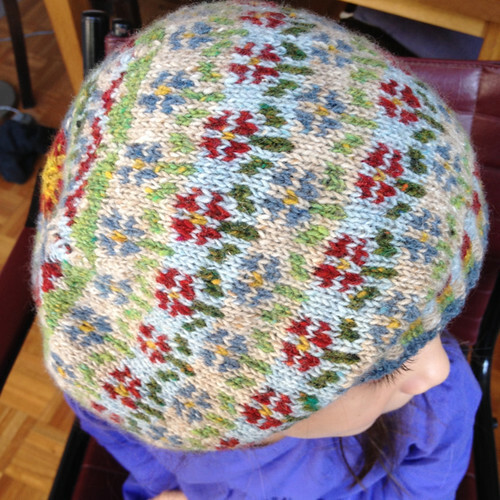 One of my knitting goals for 2014 was to become more proficient at colour-work. On second thoughts, 'goals' is a rather grand term for the vague hopes I had. So a few months ago I knitted the Kate Davies pattern Peerie Flooers using seven colours of Rowan Fine Tweed yarn that I had acquired some time ago from a very yarn-enabling friend. I'm very happy with the outcome, and except for a few places, visible on the inside, where I carried the yarn a fraction too far without weaving it in, I think it is well-made. The tension is even and the pattern displays itself neatly. 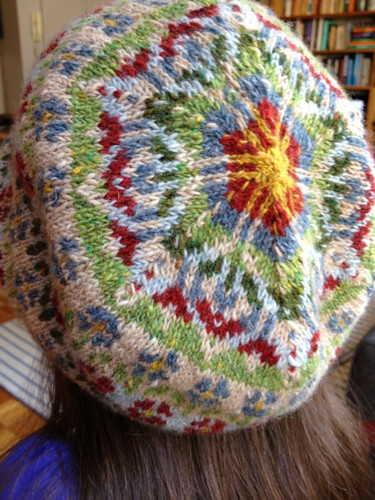 But knitting this hat has made me doubt that I will ever become a really proficient colour-work knitter. 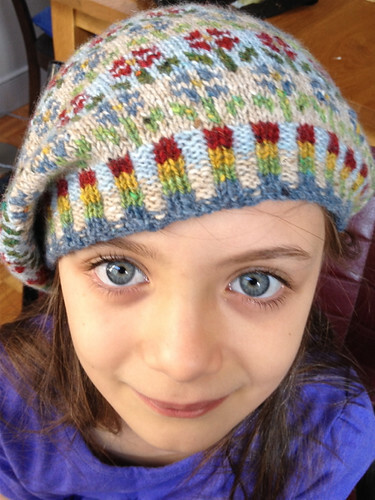 It's another version of the well-worn discussion of knitting styles. Traditional colour-work is usually done two-handed - using one colour in each hand. I'm not only very right-handed, but I also have a rather clumsy and inefficient knitting style that involves completely relinquishing my hold on the right-hand needle while I throw the stitch I'm working on. With colour-work the inefficiency of this process is emphasised because I also need to put down and take up a different colour. So, what should I do... try with greater determination to master two-handed knitting? I'm very aware of the advice about the desirability of learning new skills as one ages - both intellectually and physically. But I've tried (OK, maybe not hard enough) and the frustration of not being able to knit well with both hands takes away the pleasure of knitting, which is the main reason for doing it. 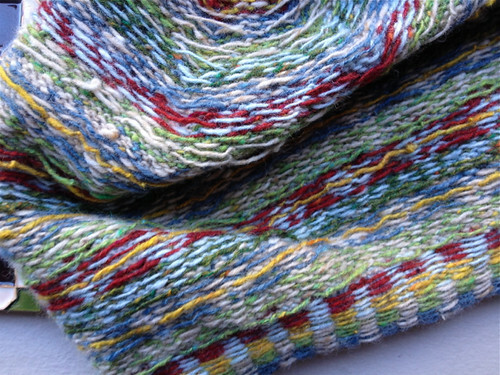 Another option would be simply to avoid colour-work and declare it not for me, but I love the finished projects and I love the association of colour-work with long-established knitting traditions. Alternatively, I could continue to potter along as I have been. After all, the outcome is fine, and if it takes me longer to finish a project than it takes other people, does it matter? I'm not knitting for my living and I don't have queues of people anxiously waiting on finished projects. Knowing my laziness, I suspect I'll fall back on my tried and true, though inefficient, pottering along. 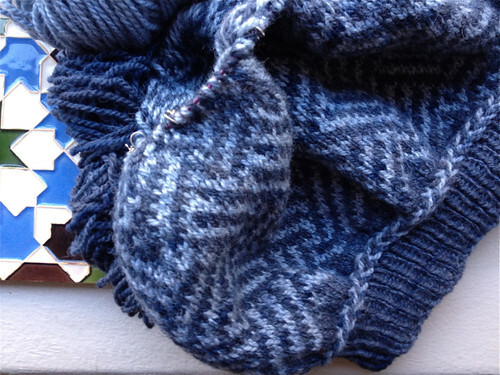 In fact, I've almost finished another Kate Davies hat design, Fugue, in two shades of greyish-blue using my clumsy technique. So far, I'm very happy with this outcome, too. However, there's possibly a problem with this pottering along solution. It's fine for small projects such as hats, but it may not work so well with larger projects that would end up taking so much time. Later this year I'll be taking some classes with a very well-known exponent of colour-work so I'll see what happens then. Maybe my embarrassment at knitting so clumsily in the presence of other knitters will be sufficient to push me to become more proficient with my left hand... but maybe not.